New radar observations have revealed that a near-Earthasteroid is actually three rocks. 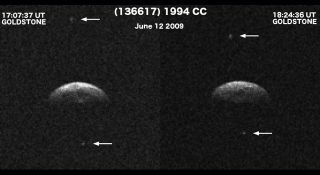 The system, asteroid 1994 CC, was imaged by NASA's GoldstoneSolar System Radar on June 12 and 14. The results were released this week. While mostasteroids roam in a belt between Mars and Jupiter, some are kicked or drawninward and cross our orbital path around the sun. Some 15 percent of thesenear-Earth asteroids are binaries. Even fewer, a mere one percent, are triples. 1994 CC, which came within 1.56 million miles (2.52 million km)of Earth on June 10 (about six times farther away than our moon), is only thesecond triple system known in the near-Earth population. The three-rock setup consists of a central object about2,300 feet (700 meters) in diameter that has two smaller moons revolving aroundit. Preliminary analysis suggests that the satellites are at least 164 feet (50m) in diameter. Asteroids are often loose rubble piles rather than solidobjects, and pairs are common. In a 2008 study, scientists found that binariescan be created when energy from sunlight, over long periods of time, splitsa loose asteroid in two. Radar observations at Arecibo Observatory in Puerto Rico,led by the center's director Mike Nolan, also detected all three objects, andthe combined observations from Goldstone and Arecibo will be used by JPLscientists and their colleagues to study 1994 CC's orbital and physicalproperties. The next comparable Earth flyby for asteroid 1994 CC willoccur in the year 2074 when the space rock trio will fly past us at a distanceof 1.6 million miles (2.5 million km).